The Chain Store Guide team has been busy of late, and we’re genuinely excited to introduce our newest product to our clients and customers – The Top 20 Restaurant Franchises (CSG’s RF20) database. We believe that there’s nothing like it on the market. It captures and links the franchisees of the Top 20 restaurant chains to each of their physical locations. The database features 18,800+ franchise owners (with contact information) and 80,700+ geocoded franchised locations throughout the US. For the first time, the RF20 lets users trace the connections between parent companies, restaurant chains, individual franchise owners and their physical storefronts. Users can quickly determine the owner of those two Burger King franchises in Anytown, USA just as easily as they can look up all 740 US Jimmy John franchisees. With franchisers and franchisees on our mind, here’s a look at the top Burger King franchisees in the US (of the 499 Burger King franchisees captured in the RF20 database). 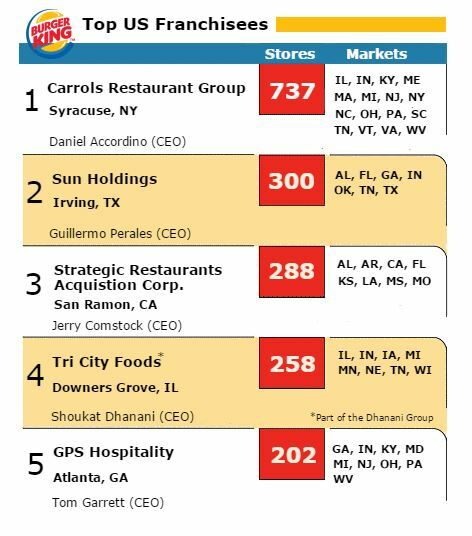 Source: Chain Store Guide’s Top 20 Restaurant Franchises (RF20) database.